Late in the afternoon, dreaming. There’s warmth on everything. Yesterday I made this cheesecake. I’ve made it again and again over the course of the week. Part because I craved it and part because I came home to place of dessert tables and long Wintered dinners that turn into never-ending evenings. And then I think about this cheesecake and become light-headed again. Hungering sets in. Afternoon shadows devour. It's all over. 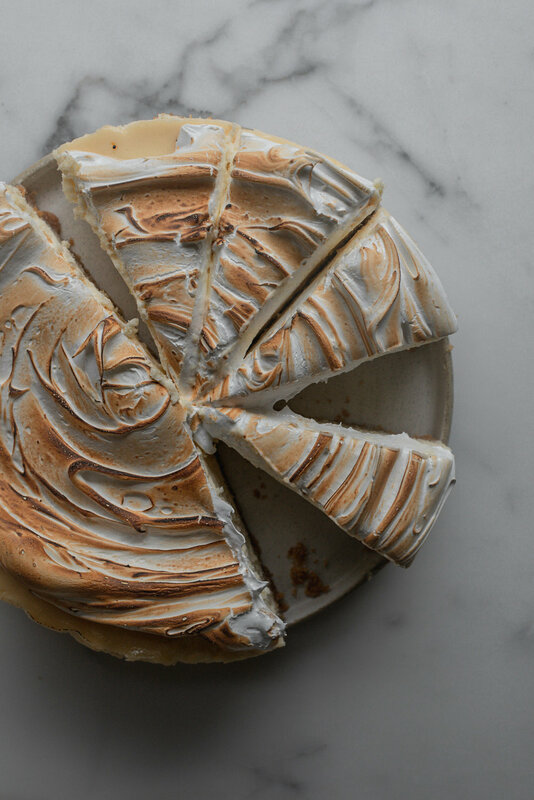 Lemon Meringue Mascarpone Cheesecake. 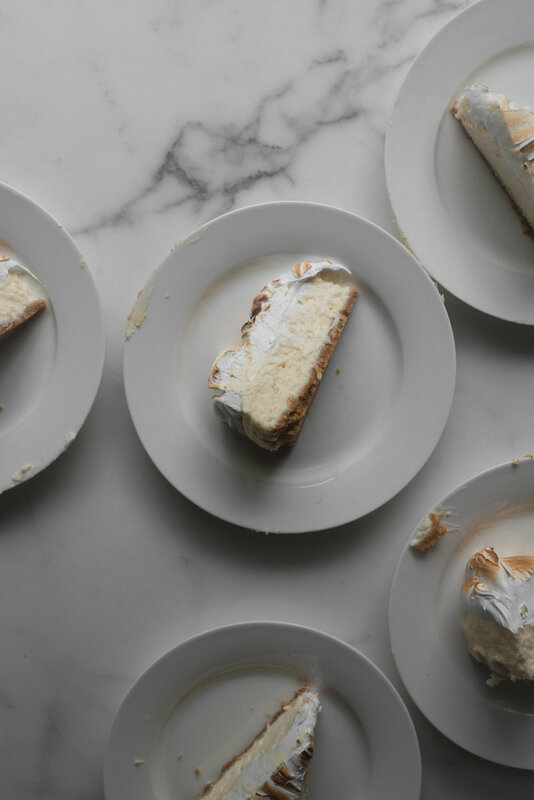 With its thick swirls of gently torched meringue, toasted almond base, and ultra-smooth, zested, and tart interior that’s both curd and cake, it’s heaven. A soft, supple, and cloudlike mouthful kind of heaven. The one of blossoming, stillness, and silence, of knowing slices end but memories remain. If I close my eyes I can still feel it all as heavily as I did the first time. And so I learn to live with my eyes shut. For this recipe, please use cream cheese that comes in block form and not tub form. I’ve found that tub form cream cheese never results in a perfectly textured cheesecake due to the air that’s pre-whipped into it. And also make sure that your cream cheese and mascarpone are both full-fat. Let your ingredients come to room temperature before baking, as room temperature ingredients are easier to blend together and handle which always results in a smoother texture. I like to do this about two hours before I begin baking, but, it depends on the season you’re in and the temperature in your kitchen. So, adjust accordingly. I like to bake the cheesecake at a very low temperature, slowly. I find it gives a softer, smoother and more supple texture. It should take about an hour and a half. Once it’s done baking, make sure to slightly pry open the oven door and let the cheesecake cool to room temperature before placing it, still in its tin, in the refrigerator to chill until firm. I use a kitchen blow torch to toast the meringue, but, on some occasions, I’ve also used a broiler. If you’re using the latter, make sure to watch the cheesecake carefully. You don’t want it to be placed under strong heat for too long. A couple of minutes maximum is all it should take to gently toast the top. Pre-heat the oven to 180 c (350 f). Grease and line a 20 cm (8 inch) springform cake pan with non-stick parchment paper. Cover the sides of the pan with a layer of aluminum foil. Set aside. In a medium sized mixing bowl, stir together the digestive biscuits, almond meal and salt. Add in the melted butter and stir until everything is evenly moistened. Tip the mixture into the base of the prepared cake pan and gently press it into a thin and even layer. Bake for 10 minutes, or until fragrant and just beginning to turn golden brown. Remove from the oven and set aside to cool. Immediately lower the oven temperature to 120 c (250 f). Fill a deep-dish roasting pan with a few inches of water. Place it in the bottom or the lowest shelf of the oven. To make the filling, add the cream cheese to the bowl of a stand mixer fitted with the beater attachment. Beat on medium speed, until smooth and malleable, about 3 minutes. Pause mixing and scrape down the bottom and sides of the bowl. Add in the mascarpone and sugar. Beat until well incorporated and fluffy, 2 more minutes. Add in the eggs, one at a time, making sure to beat well after each addition. Beat in the lemon juice, vanilla bean extract, zest and salt until very smooth, light, and well combined, 4 more minutes. Pour the filling over the cooled crust and use an offset spatula or the back of a metal spoon to smooth out the top. Bake the cheesecake for about 1 ½ hours. The cheesecake is ready when it is firm around the edges and just firm in the middle but with a slight jiggle to it. Turn off the heat and pry open the oven door. Let the cheesecake cool in the partially opened oven until it reaches room temperature, about an hour. Do not unmold the cheesecake from its pan. When it’s at room temperature, place it in the refrigerator to chill for at least 6 hours, or preferably, overnight, before topping with the meringue and serving. To make the meringue, put the egg whites and sugar into the bowl of a stand mixer set over a saucepan of barely simmering water. Do not let the base of the bowl touch the water. Heat the mixture, stirring often, until it reaches 70 c (160 f) on a candy thermometer. Once at temperature, remove the bowl from the heat and place it onto a stand mixer fitted with the whisk attachment. Whisk, on medium-high speed, until the mixture forms that of stiff and glossy peaks, about 6 to 8 minutes. The bowl should be cool to the touch and all the steam will have escaped the meringue. Pause mixing and add in the lemon zest. Whisk for a further 30 seconds until combined. Set the bowl aside. Unmold the cheesecake from the pan and set it out and onto a serving plate. Spread the meringue over the top of the cheesecake in a swoop and swirl motion using the back of a metal spoon or an offset palette knife. Then, using a kitchen blow torch, carefully toast the top of the meringue. If you’re using a broiler, place it under the broiler until the meringue is evenly browned, about 2 minutes. Keep the cheesecake chilled until you’re ready to slice and serve.